When Hope and her aunt move to small-town Wisconsin to take over the local diner, Hope’s not sure what to expect. But what they find is that the owner, G.T., isn’t quite ready to give up yet–in fact, he’s decided to run for mayor against a corrupt candidate. And as Hope starts to make her place at the diner, she also finds herself caught up in G.T.’s campaign–particularly his visions for the future. After all, as G.T. points out, everyone can use a little hope to help get through the tough times . . . even Hope herself. The first time I read about this book was from Peter’s blog, and it had me with the words diner, pie, and hope. I’ve seen Joan Bauer’s books in bookstores but I always ignored it until I read Peter’s review of it, and I put it on my radar. When my book club friend Louize brought a copy during our last discussion, I asked if I could borrow it, and immediately started reading it the next day. I had a feeling it was going to be a feel-good book, and I wasn’t wrong. Hope Yancey’s real name is Tulip, but ever since her mom left her in the care of her aunt, she changed her name to Hope, something that she thought fitted her better. She moved around a lot with her Aunt Addie, who is an excellent cook and a diner manager. When the owner of the last diner they worked in in New York City stole money from them and left them with nothing, Addie and Hope move to Wisconsin to help manage Welcome Stairways, a little diner owned by G.T. Stoop who was sick with leukemia. G.T. got them onboard because he had other plans for their little town – he wanted to run for mayor to beat the corrupt Eli Millstone who’s had the town in his hands for year. Hope and her aunt gets involved in this campaign, but they didn’t know what people desperate to keep power would do to keep people out…but Hope chose her name for a reason, and even if she isn’t feeling particularly hopeful herself, she is finding that there were a lot of reasons to keep the hope in the midst of the hardest time in her life. 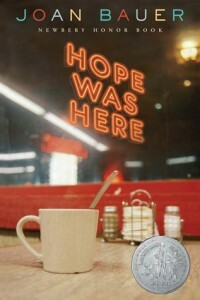 I breezed through Hope Was Here, not because it was a super-easy read but because it was really interesting. I realized that I really like reading about small town, diner settings (case in point: Bittersweet by Sarah Ockler, Speechless by Hannah Harrington, and Catch of the Day by Kristan Higgins). I really liked the small family that always forms inside diners, and how it makes working there seem really fun, despite it being hectic come peak hours. Of course I loved the food descriptions (homemade corned beef hash and fried eggs with a big piece of maple corn bread slathered with salted butter…mmm), and how food played a big part in their lives without it becoming too much of a foodie book. I liked how the book didn’t seem complicated even with several plots — G.T.’s campaign, Hope’s issues with her mom, her search for her dad. I liked how they all played with each other well, all supporting the main theme of having hope and keeping it, even if things don’t feel particularly hopeful. Yes, there’s also romance, and one of them I predicted from when the lead interest appeared, but both of them worked quite well. A part of me felt that the love interests seemed too old for their partners, but I learned to adjust how I imagined them later on. I think I just had a bit of stereotype in my head when I started reading it. This book reminded me of those books that my mom bought for me when I was in elementary and high school — full of life lessons and utter positivity. I can still remember most of them, and I think the reason why those books stayed with me even after years is because the plot felt real, and the characters were wonderfully flawed and yet they still prevailed in the best way. I bet if my mom had read the blurb of Hope Was Here back when she was still buying books for me, she would have gotten this, too.